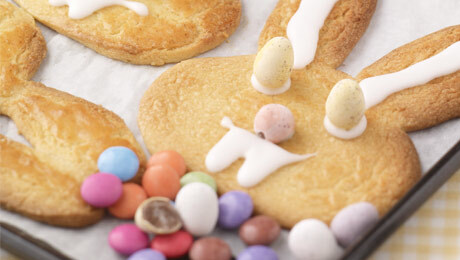 A great recipe for making with kids at Easter. Cream the butter and sugar together in a glass bowl, and add the egg yolk and vanilla extract. Sieve in the plain flour and combine until the flour is fully incorporated then allow to rest. Roll the dough on a lightly floured surface, the cut into required shapes. Lay the biscuits on a lightly greased baking tray and place in the oven for 10-12 minutes, until golden brown. You could use a knife to cut them out. They won't be the exact same size and shape as each other but it should work fine. How do you do the rabbit's face if you don't have a cutter? ?